About those lobbyists and the NRA . . . The Left tries to blame the NRA every time there is a shooting, even though none of the NRA members ever do the shootings in question. They make a big deal out of how the NRA has donated to politicians. But check out the top lobbyists for 2017. The NRA is not one of the top 20 lobbyists, but even if they were, shut up, because 2nd Amendment. And look who is on the list! Comcast, the customer service giant (ahem) and supporter of Leftist favorite “Net Neutrality.” So you know that would be good for consumers. There are also lots of medical companies who want the government to give them more business. And the Chamber of Commerce, which loves illegal aliens as much as the Left. And worst of all, the gun-grabbing Leftists ignore how Planned Parenthood, government-sector unions and other Leftist organizations partner with the politicians to take turns giving each other our money. 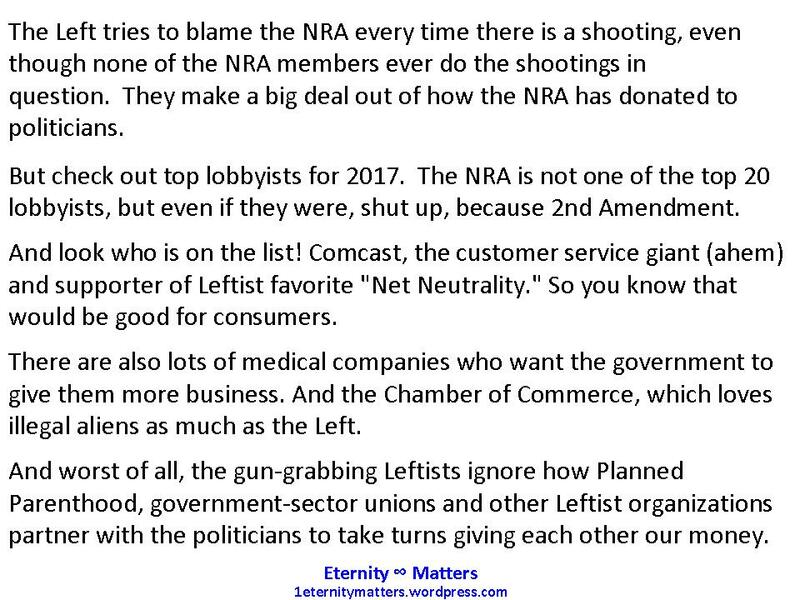 Please remind Leftists of these things when they bring up the NRA. They pretend that all pro-lifers are violent just because a very small number have been violent and when their violence is the opposite of the beliefs of the movement and of Christianity. Oh, and they ignore the spectacular violence of abortions. They pretend that all gun owners are to blame when a very small number break gun laws and harm others. And they ignore the countless lives saved by guns. They think the Constitution doesn’t give you a right to bear arms but that it does give you the right to a dead baby. These ghouls literally believe that you can kill a child up to her first breath for any reason with Jesus’ approval. They pretend that Islam is a “religion of peace” and that the murderers are the exception. To do that they have to ignore the entire history of Islam. That’s hard work! They ignore the obvious: Muslim violence is in accord with its founder and teachings, whereas violence in the name of Christ is not. Then again, remember that these “Christians” believe the opposite of Christians on all major doctrines.